It was August 18, 2017, when I gained the summit of Mont Jacques-Cartier, an alpine peak of shattered stone and meager vegetation some 1,270 metres above Quebec’s Gaspé Peninsula. Several stones were organized into mounds, marking the trail that all visitors were obliged to follow. Just beyond them, lounging in no-man’s-land with a mountainous backdrop, were the very last of the Atlantic-Gaspésie caribou. This population is restricted to Atlantic Canada south of the St. Lawrence River, and can now only be found atop these particular mountains in Gaspésie. Here was the end of a very long pilgrimage for me, but more so for them. At one time the historic range of this population of iconic caribou covered all of the Maritime provinces, as well as the wilderness of southeastern Quebec. Their tenure here can be dated back to the recession of the glaciers. Many dozens of Nova Scotia’s landmarks are still named for their historic herds, such as Caribou Island, Caribou Bog, Caribou Road and Caribou Harbour. The presence of this species in New Brunswick hasn’t even passed beyond living memory. 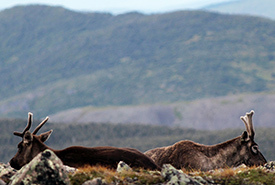 These Atlantic-Gaspésie caribou, a subpopulation of the woodland caribou, have adapted to Eastern Canada’s now diminished old-growth boreal forests with generally smaller antlers, trading the famously long migrations of other populations across Canada for a simple seasonal hike, from winter lowlands to summer highlands. In short, these caribou are unique and considered one of our country’s 12 irreplaceable populations by the Committee on the Status of Endangered Wildlife in Canada, a reality made especially sad by their thorough decline over the last four centuries. I spoke with Andrew Hebda, curator of zoology with Nova Scotia’s Museum of Natural History. For every question concerning his province’s absent caribou, he left his chair, returning with well-aged volumes and threw open their loose pages. Unfortunately, they couldn’t tell us much. Andrew summarized our limited understanding of these caribou by saying, “They were here, and now they’re not. The factors which expelled them, however, are clear enough. The thorough removal of old forest habitat for the sake of agriculture and lumber left them without a safe haven. And given the province’s narrowness, their seasonal destinations were easily predicted by hunters. By the 1840s–1850s, said Andrew, the decline in Nova Scotian caribou was well underway. The final blow to these provincial caribou, and indeed the Atlantic population at large, was the influx of white-tailed deer, made possible by a gradually warming climate and the shift to younger forest types encouraged by European settlement. These invading deer carried with them the brainworm Parelaphostrongylus tenuis, to which they themselves are immune. When passed onto other members of the deer family, however, such as moose and caribou, this brainworm becomes lethal. The effective extirpation (locally extinct) of Nova Scotia’s caribou is traced to 1905 on the mainland and 1912 on Cape Breton Island, although sightings continued until 1921. Put simply, the province was no longer hospitable — its forests immature, its predators armed with rifles and its competition carrying the plague. This state of affairs was exemplified by two separate attempts at reintroduction, in 1939 at the Liscomb Game Sanctuary and among the Cape Breton Highlands in the late 1960s. Neither attempt succeeded. 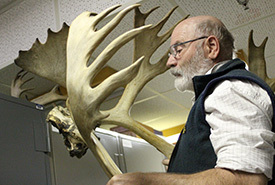 All that remains of these Scotian caribou are the bones and antlers in Andrew’s archives, a network of frigid rooms kept so by thunderous compressors. Some remains came with a clue as to their origin, but most were just dropped off over the decades. Several still bear screw holes from their time on living room walls. Nova Scotia is a case study for the population’s retreat at large, because by 1927 these same events played out again in New Brunswick, and much earlier on PEI, the last written record of its resident caribou coming from 1765. With the loss of the Atlantic-Gaspésie caribou population in the Maritimes, these caribou could only be found in Quebec south of the St. Lawrence River, but their retreat continued, from Quebec City in 1929 to the valleys of the Gaspé Peninsula by the 1950s. Today, the Atlantic-Gaspésie population have but one stronghold in all of Eastern Canada — the Chic Choc Mountains of Gaspésie National Park — and even here their hold is faltering. 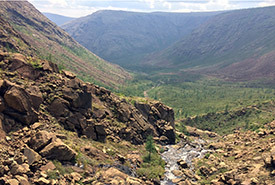 I’ve visited several of the Maritime locales known to have supported Atlantic caribou in the past, such as the red dunes and grasslands of PEI National Park and the bulging granite shores of Duncan’s Cove, Nova Scotia, but none could compare to these mountains and their ecosystems. Leading up to the park, you’re presented with the Rivière Sainte-Anne, with salmon the length of my arm visible beneath its calmer pools. The impressive mountains rise on either side of the road, the green and burgundy of their forested flanks giving way to smooth brown peaks. The first wild moose to ever cross my path did so within 10 minutes of entering the park. Gaspésie National Park was established in 1937, and according to its current director, Pascal Lévesque, there were four reasons for this: to protect the Rivière Sainte-Anne and its salmon, to prevent the commercial development of its mountains, to house the fleeting Atlantic caribou and to encourage eco-tourism. 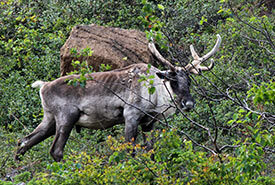 Hunting of caribou on the peninsula has been illegal since 1949 and industries such as logging and mining haven’t been permitted within the park since 1977. 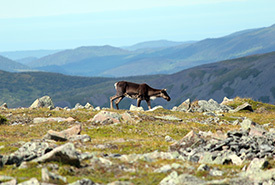 Visitors can only hike through select caribou territories and even then, only during the day from late June until late September in the case of Mont Jacques-Cartier. These are thorough precautions, but, sadly, they haven’t been enough. By the 1950s, these mountains still harboured between 700 and 1,500 caribou, but by the 1990s they had declined to a mere 200 individuals. Today there are 90. Stay tuned for part two, scheduled for March 2, 2019. This article was originally published in Rural Delivery Magazine. Zack Metcalfe is a freelance journalist, photographer, columnist and author active across the Canadian Maritimes. Read more about Zack Metcalfe.